When we read Dr. Seuss’ Oh The Places You’ll Go’ we may assume our kids will only go to good places with good people in pastel-coloured backdrops. Surely our children will never be in a situation where they need to get out quickly. But in the blink of an eye, these children who were safely tucked under our wing, suddenly have increasing freedom as teens. And we need to be prepared in case something goes wrong. Instead of wondering if our teens will be equipped to leave a stressful situaton, we need a plan. A simple plan to keep our teenagers safe, while keeping the communication lines open. 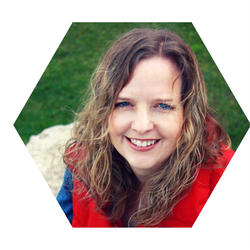 Will our teens be equipped to get out of a stressful situation? In a series of bad parenting moves and poor planning, our teenager almost found himself in a bad place. 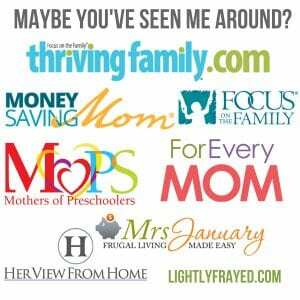 Can I vulnerably share my own lack of a plan in order to benefit your family? A few years ago, our son was invited to a party. The daughter’s parents made a plan to keep it at a small size. Friends had to receive a personal invitation, in order to attend. We had talked about how parties could quickly get out of control, even in size. Not far from us, 1500 people showed up to a house party which was supposed to include a “few friends,” thanks to social media. My son assured us this girl was from a quiet family who had taken precautions. He was adamant that she was not someone who would have a large party. Mistake #1 I didn’t contact the parents myself. My son’s friend said his dad would drive them both to the party and we set a reasonable pick up time at the end of the night. Mistake #2 I should have dropped him off myself to avoid a near-disaster later. I was supposed to pick my son up at 11:00. This was the latest he had been allowed to stay out, but I was trying to offer extra freedom since he had not asked to attend a gathering of school friends before. At the end of the night, right before I left to pick him up, my son called the house. He spoke to his Dad and told him he was ready for a ride home. Since I was already planning on getting him, I motioned to my husband that I would head out, and hopped in the car. As I neared the party’s location, I spotted police cars barricading off this residential road. There were clusters of teenagers milling about outside. I spoke to an officer and told him my son was in the house and I was here to pick him up. He told me to text him and have him come out, because no one was allowed in the house. Mistake #4 I didn’t have a phone. Mistake #5 My son didn’t have a phone either. We were basically a phoneless, disconnected pair. I had no way to reach him. I knew that at least one of us was panic-stricken and desperately needing chocolate. Trying to reassure myself, I asked what the situation was inside the house. The officer said the party had gotten out of control. Way too many people showed up and there were reportedly some kids with weapons there. My legs went weak, and threatened to collapse in panic. In a sea of teenage faces, I spotted a familiar face – a boy I recognized as my son’s friend. Trying not to hug him (no one wants to be that awkward mom, even when an angel appears in our fear). But he didn’t know where my son was – by the time this boy had arrived, the police had already started breaking up the party. I pushed myself into action, digging deep and pretending to be calm. Like I had experience losing track of my boy at police-invaded parties. I offered to drive my new best friend home if he would stay with me until we sorted it out and bless his heart, he agreed. We walked around the street then drove through nearby streets to see if we could find my boy. No luck. Mistake # 3 (again): Don’t let your husband take phone messages. In his defense, my husband didn’t realize the location was important. He didn’t realize my son had changed our pre-arranged pick up location. Ready for a happy ending? I sure was. My son was exactly where he said he would be. In front of a dimly lit school on a quiet street with no one in sight. Once the adrenaline subsided (his and mine), it turned out some of his decisions had not been as terrible as I thought. When his friend’s dad dropped them off, there was already a huge line up of teenagers trying to get into the party. The poor parents and neighbours were standing at the front door, refusing to let anyone in. If I HAD been the dropper-offer, you had better believe that would have been the end of this adventure! But no, this dad allowed the kids to get out of the car and ‘have fun.’ Seriously? My son and a few friends decided to hang out in the area. They had been walking up and down residential streets for a few hours. They NEVER entered the party with the not-good guys and the weapons and all the danger. Could I have done so many things differently? Absolutely. No one wants to be the irresponsible Mom. No one wants to announce to the world that they were the irresponsible Mom. Even reliving this story makes me feel all the feels again. But I was compelled to share this to remind parents that the most innocent plans can go south at an alarming rate. And that we all need to be prepared. Now that we know what NOT to do, here are some suggestions to set yourselves up for success. A father recently created the X Plan to help his teens get out of any uncomfortable situation, while still saving face in front of their peers. I’m always on the hunt for tools to add to my parenting toolbox – and the X Plan is a great one. It is like the lifesaving Stop-Drop-And-Roll mantra for elementary students. You hope they don’t have to use it but it needs to be in place in case they ever do. The X Plan will only be effective if we do our part as parents. And our role is just as important as that of our teenagers. How do we keep teenagers safe with the x plan? Bert Fulks discovered that every teenager he worked with wished they had an escape plan at least once in their lives. And many faced huge regrets because they did not. He wanted to see that change for his own children and others, so he is asking parents to spread the word about this simple plan called the X Plan. Once a teen texts a family member the letter ‘X’, their calm, smooth rescue will be activated. Parents will calmly call them and tell them they need to come right away to pick them up for a family emergency. It’s that simple. In order for the X plan to work, we need to be accessible to our teenagers. Anytime. No matter the situation they find themselves in, they need to be able to reach us night or day. Keep the phone charged and close whenever your teen is out. So much of my above panic could have been avoided if we had been able to quickly communicate with each other. Of course – the assumption is that our teens will do the same. But that may not be worth mentioning since teens are more likely to forget to put pants on than to forget to take their devices with them. The commitment states that there will be no questions asked after the teen has reached out for help. No matter where they are, or who they are with, parents will simply pick them up and head home. Will this be the hardest step in the process? Absolutely. But if our teens can’t trust us to keep our end of the deal, they will not reach out for help the next time. And we want to remove all barriers that would prevent them from reaching out since even signaling for our help is very brave. 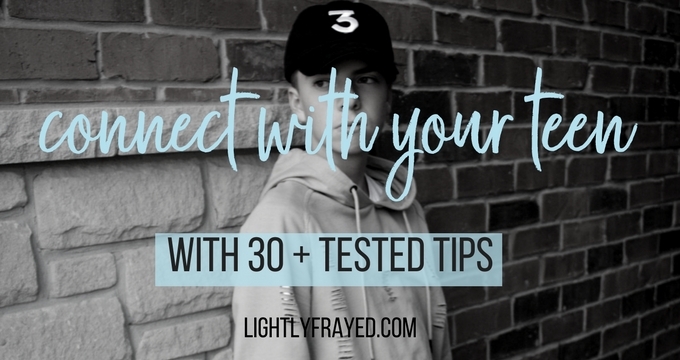 Even if our teens are going through a prickly stage, sending every vibe that we are the last people they want to talk to, we must do our part to keep lines of communication open. 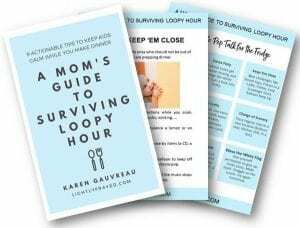 I am learning that when my instinct is to pull away, that is a signal to lean in – in a casual, absolutely-not-awkward, chill Mama way, of course. However tumultuous your relationship seems, do not give up. High school students have told me they were grateful that their parents didn’t give up on them even though they knew they were hard to be around. And they later thanked the same parents they had resisted all of those years. 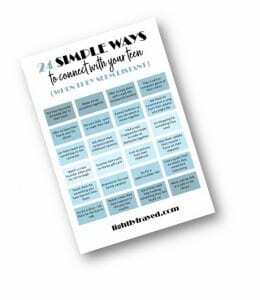 Need this free printable packed with quick, actionable ideas to connect with your teens? 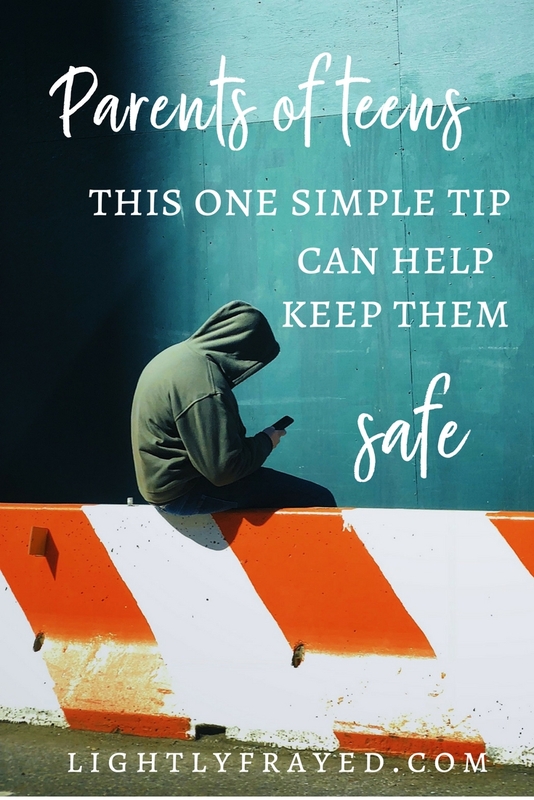 Connecting positively, even in small ways, will help our teenagers avoid situations requiring an escape plan. But if they do find themselves in need of the plan, reconnecting after the dust has settled is equally important. Please help spread the word about this X Plan – and when you do, gently remind other parents of their role in helping the plan succeed. Have you set up a family system to give your teenagers a way out, no matter what? I am so glad that you posted about this! I had never heard of it, but plan to put this into action with our 15 year old! Great post!